Come join us for the launch of Michael Jones McKean’s The Rainbow: Certain Principles of Light and Shapes Between Forms. The project will launch with a public tour on Friday, June 22 followed by a panel discussion and opening reception on Saturday, June 23, 2012. Morning and evening rainbow events will be presented each day. All events are free and open to the public. Artist Michael Jones McKean will lead the public tour of The Rainbow system and gallery exhibition on Friday, June 22, at 6:00 pm. 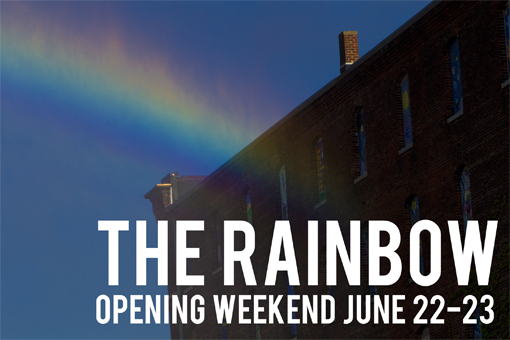 On Saturday June 23 at 5:00 pm, a panel discussion moderated by Bemis Center chief curator Hesse McGraw and featuring the entire project team will explore the cross-disciplinary collaboration that made The Rainbow possible. Following the panel, an opening reception will be held at 6:00 pm. 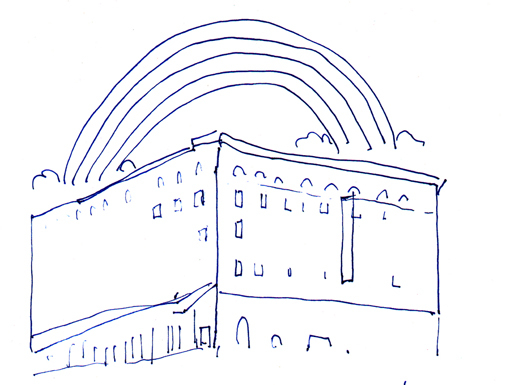 Both evenings will culminate in a simple, but phenomenal, visual event — a rainbow in the sky. These rainbows will be the first in a series of twice-daily events to occur above our building at 12th & Leavenworth St. in Omaha, Nebaska this summer. The Rainbow is heavily dependent on weather conditions, so events will be scheduled 24 hours in advance. Information on upcoming rainbows can be found at www.therainbow.org, our Facebook page, or by using The Rainbow mobile app.